Black-market traders have increasingly been tapping into an invisible network to funnel a wide range of goods into global markets right under the noses of customs and border protection agents—to the tune of over $500 billion. All of the merchandise —including luxury designer wares such as Chloé ankle boots, Chanel Le Boy bags, Saint Laurent wallets or chic Ray-Ban shades — are not authentic brand-name products but inexpensive replicas that are undeniably, shamelessly fake. And they now command a half-trillion-dollar market that’s expanding at astronomical rates. The market for counterfeit goods has reached alarming proportions, powered by tech-savvy traders lurking in dark corners of the internet. According to a report by the European Union’s intellectual property office (EUIPO) and the Organization for Economic Co-operation and Development (OECD), the market for illicit goods has grown by over 100 percent over the past decade, with counterfeits accounting for 3.3 percent ($590 billion) of international trade in 2016 compared to $250 billion in 2008. Interestingly, the surge came against a backdrop of falling global trade volumes. The report was compiled by analyzing thousands of customs seizures, with footwear, clothing, leather goods and IT equipment topping the list of the most frequently seized imported fakes. The report also reiterated another well-known trend: China, by far, remains the biggest source of fake goods. 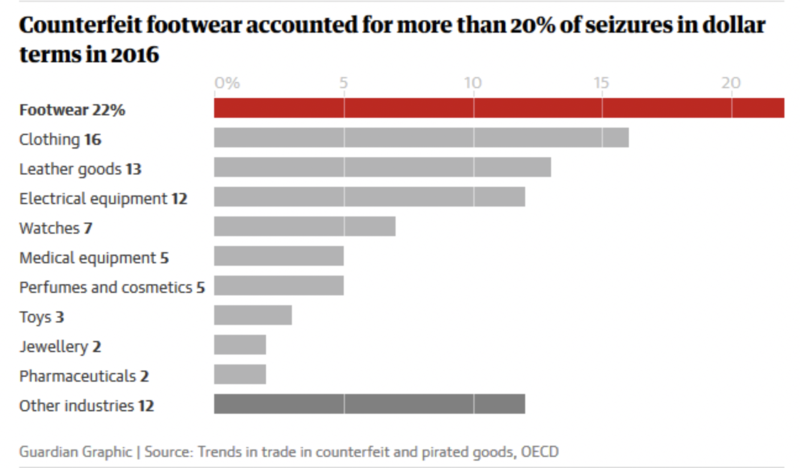 China was the main source of counterfeit products in 9 out of 10 categories tracked by the trade watchdogs with as many as 27 percent of seized goods being traced back to the country. Other leading offenders include India, Malaysia, Pakistan, Turkey, Thailand and Vietnam. Related: Is A Gold Breakout Near? Interestingly, the latest fake goods report seems to closely mirror another 2016 independent report titled: Social media and luxury goods counterfeit: a growing concern for government, industry and consumers worldwide that was published in the Washington Post. Both reports identified the explosive growth in online technologies as a key reason for the proliferation in the trade in counterfeit goods. Many counterfeit sellers are technology-savvy and use instant messenger apps such as Telegram or Whatsapp that provide end-to-end encryption to hide their nefarious activities. They are also adept at using fake accounts, spam bots or deploy botnets to avoid being flagged by internal security systems and post thousands of images on a daily basis. If an account is exposed and blocked by Instagram, it often reappears under a new profile name sometimes in a matter of hours. Buyers of luxury goods, beware: luxury products seem to be the category most heavily targeted by sellers of these scam products. According to the Washington Post report, as many as 20 percent of 750,000 Instagram posts about top fashion brands that they analyzed featured illicit products with Prada, Chanel, Fendi, Louis Vuitton along with Cartier and Rolex among the most affected luxury brands. Overall, the internet acts as a ‘giant amplifier’ that provides an almost direct line that connects producers and consumers with no filters or barriers. While the internet has no doubt played a big part in expanding the fake goods business, it’s highly likely that most buyers of counterfeit products do it the traditional way—from some backstreet vendor where they can see, touch, feel, smell and readily identify them as cheap knockoffs. It has always seemed like the fashion industry was merely engaging in marketing rhetoric when it tells us that counterfeits are bad for us. Many people who knowingly buy fake goods do it in an attempt to polish their self-image—cheaply and through deception. Yet, studies have shown that such people could be biting off more than they can chew—by incurring a huge psychological burden that makes them feel compelled to cheat in other areas of life, too. One such study by researchers from Harvard Business School, UNC Chapel Hill and Duke University published in Scientific American, makes for compelling reading. So maybe it’s not just a clever ruse drummed up by makers of ostentatious goods. All those dudes rocking faux Prada belts and ladies swinging plastic Birkin bags might succeed in fooling everyone but themselves.